California Consulting Presents at State Water Resource Control Board-Prop 1 Groundwater Sustainability on behalf of our clients - California Consulting, INC.
California Consulting LLC is very pleased to have our Southern California Director, Haig Kartounian, present, on behalf of our clients, at the State Water Resource Control Board- Prop. 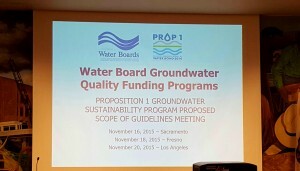 1 Groundwater Sustainability meeting in Los Angeles on Friday, November 20, 2015. Proposition 1 was passed by voters in November 2014 and provided $900 million for a Groundwater Sustainability Program (Assembly Bill 1471, Chapter 10). The State Water Board will administer $800 million to prevent and cleanup contamination of groundwater that serves (or has served) as a source of drinking water. The funds can be provided as grants or loans. A summary of the program is provided in aProposition 1 Groundwater Sustainability Fact Sheet.